The magician pours wine into an empty wine goblet and lets go of the glass as he is pouring. The glass magically remains suspended in air while the wine is still being poured from the bottle. An excellent stage effect! 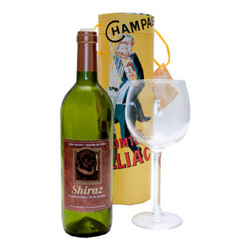 Our gimmick can be removed and placed in any standard wine or champagne bottle. Our wine glass is absolutely clear and the gimmick on the glass cannot be detected. This is a great improvement over the frosted glasses on the market because with the clear glass there appears that there is nothing to hide!